The 2018 Heavenly Bodies Met Gala was truly one for the ages; Katy Perry donned some wings, Rihanna was (is) the Pope and Sarah Jessica Parker put something extravagant on her head - again. But we have to say we're secretly down for who's taking who, and there were some serious public debuts on the red carpet. And while the Weeknd was noticeably absent form the arms of both Selena and Bella, *tears*, we still have plenty of ridiculously good looking people to remind us that true love is alive and well (for tonight, at least). New mum Kylie Jenner and baby daddy Travis Scott. Forever King and Queen of the Prom - Tom Brady and Gisele Bundchen. Cutie-pies Shawn Mendes and Hailey Baldwin. A-Rod evidently has J-Lo's (fierce) back. Dying. Lili Reinhart and Cole Sprouse of Riverdale make their romance O-FFIC-IAL. GUYS. Enough. Irina Shayk and Bradley Cooper make looking superhuman a normal thing. 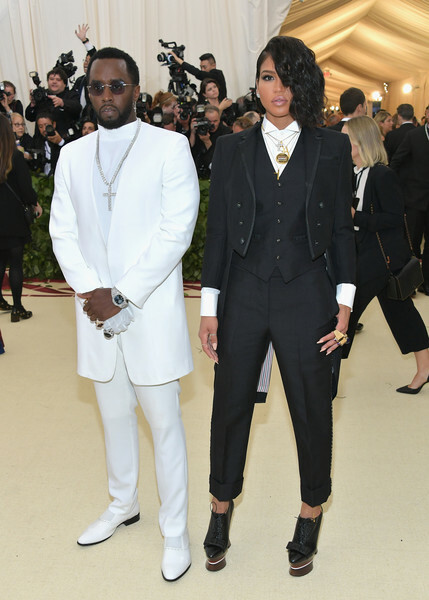 A lot of bad-assery happening here via Sean 'Diddy' Combs and Cassie Ventura (standard Diddy in white). Get a guy who looks at you (and helps you with your train) like George Clooney does with Amal. All-time TV hosts Stephen Colbert and Jimmy Fallon buddy up to just quietly put on the ritz. Pharrell Williams and wife Helen Lasichanh doing casual date night. King and Queen of darkness Nick Cave and wife Susie Bick just being themselves in Gucci. That couple coordination via Letitia Wright and John Boyega. Ok so NOT exactly a couple, but in our wildest dreams Gucci's Alessandro Michele marries LDR and Jared Leto. Ok, also not a couple but LOOK AT THEM. Migos in matching Versace. Nothing like a little self promotion. Jaden Smith's date was his gold record. And saving the best 'til last. Rihanna and HER HEADPIECE. Feeling like you wanna get fancy after all this glam? Shop the best of our show stopping dresses! Splendour in the Grass has gone and dropped an epic line-up for 2018, and is officially the only light in winter's dark tunnel. Press play.